Login to Web Robots portal on Chrome browser. Make sure you have Web Robots Chrome extension to run the robot. 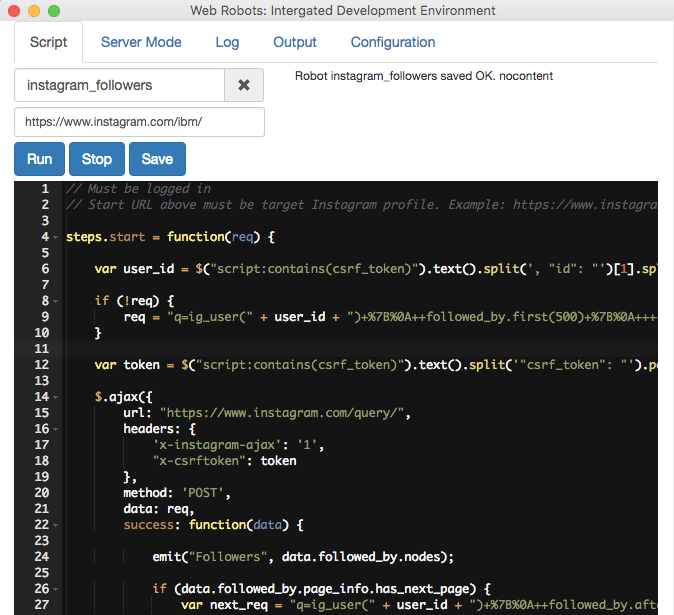 Open robot instagram_followers in our extension. Make sure you are logged in on Instagram website. Modify start URL to the desired Instagram profile (example: https://www.instagram.com/ibm) and click Run. When robot is finished data will be available on portal in CSV and JSON formats. Hi Lisa, Thanks for pointing out. We formatted the code differently and now you can copy-paste just fine. I tested it just now. Enjoy! How long does it take for data to show, think I did all the steps correctly, but still shows zero data after 5-10 minutes, is that normal? 100k records limit applies to download using CSV button on portal. This limit has to be there to avoid perormance problems as portal generates file in real-time. This process uses a lot of compute resources. However this limitation is not a problem. Each successful run also generates complete CSV and JSON files for download. Files usually take several minutes to appear under the run in the “Files” section. Just refresh run results page after several minutes from run completion. Love this tool. Is there any way this tool can scrape followings instead of followers? Hi, thanks for commenting on this issue. Instagram changed their website’s internal structure. Robot is now adjusted and works! Robot code in this blog post is also up to date. Hey Nicerobot, that’s quite awesome. Works like a charm. Is there a way to add number of followers for each follower? That would be cool! It would be great if it could scrape the followers and only add them to the csv file if the follower has greater than 10 posts (for example or any number chosen) to try to filter out all the fake postless accounts out there. It is possible to implement by opening each follower separately and checking their stats. Looks doable on a small scale. Robot’s running time would grow significantly. This is great, any chance there is code you’ve created to follow the accounts that are dumped into the CVS? If there is a tool out there, would appreciate someone pointing me in the right direction! No we haven’t done such a thing. I think it would be very intrusive and not appreceated by Instagram. Can I input a list of usernames (for example, @ibm, @nike, @instagram) and have this scraper pull the profile data for each username into a .csv. For example, username, first name, last name, # of followers, #of followings, # of posts, bio? Helo Nice Robot, i, would like to buy this as an application on my windows7 if its possible can you reach me via email or skype? ill be waiting for you. thank you. Nice Robot- not able to get this script to work. Any idea why not? Sadly, Instagram has a new website design and this robot will not work until we recreate it for the new design. hate that- would love to use it again once it gets recreated. Where can I find the CSV after it’s finishd? Nevermind, I tried it for Instagram so that’s why I couldn’t find anything… Do you know when the robot will get recreated? hello my friend, i wanna ask to all of this members ^^, i can’t save file in output menu on webrobot extension :( and i was bringed into portal, but there is nothing download botton ( CSV ) anyone can help me?